I'm going to keep today's entry short but sweet. Today's Vegan MoFo prompt poses the question--what would you make if Barack Obama was coming over for dinner? I interpreted this as--what is your absolute favorite meal that you'd love to share with someone to really make an impression? 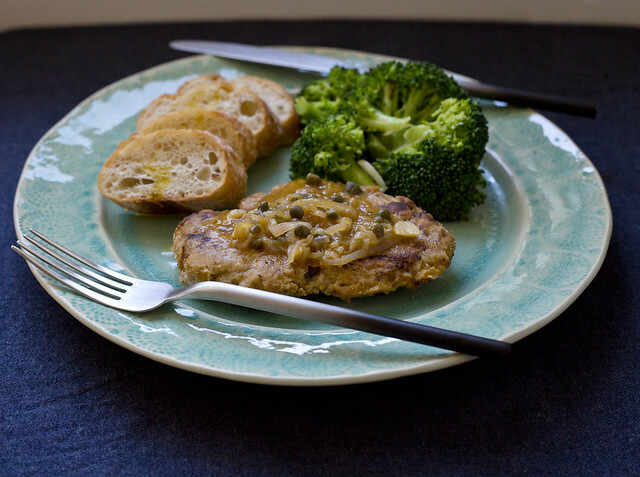 My answer--seitan piccata!! 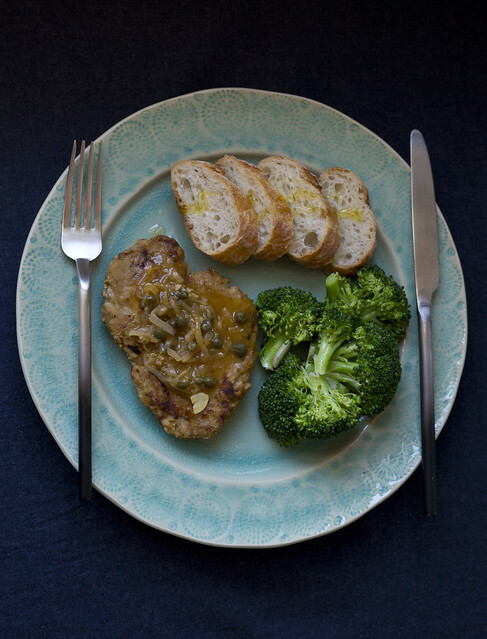 Seitan piccata is one of those meals I always enjoy when I go to a fancy vegan place (like Blossom or Candle 79), but somehow it always seemed a bit too crazy to make in my own kitchen. But no more! Where did I go for this seitan piccata recipe you ask? Do you even have to ask? Veganomicon. But then I discovered that Isa has recently posted a slightly revised version on PPK! Either way, you won't be disappointed. This is so good (tasting the sauce made me do my happy dance). I made the chicken stylee seitan with this and I really love it for the taste and texture. Delish! In discussing the post with one of my friends, her response was, "What does Obama like to eat?" Of course! So a quick google search told me--broccoli! I've paired my seitan with some broccoli (your welcome Obama!) sautéed with garlic, a splash of white wine and a pinch of oregano, basil, and thyme (and salt and pepper of course!). If this plate looks a bit bare, let's just say I had some trouble with my yellow potatoes, so my mash never made it to the plate...but I'd definitely recommend serving over some mashed potatoes. That's the perfect piccata pairing, in my book. I've owned Veganomicon for ages but have only just started using it. I've been eyeing up the seitan piccata recipe. After this glowing recommendation, I'll have to give it a go! Great! I highly recommend...had leftovers tonight and I was practically licking that sauce off my plate! Can I invite myself to the "party"?